What kid doesn't grow up wanting to be Charlie in Willy Wonka? I mean come on, all that candy just a short reach away and all the mechanics to research and develop whatever you want? 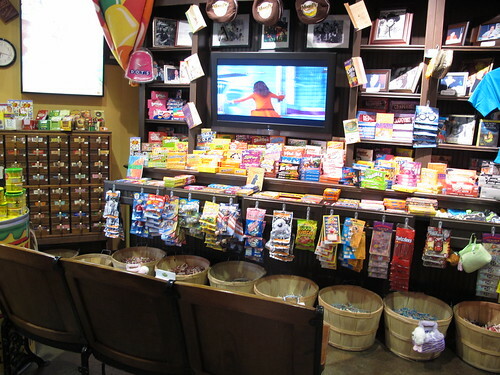 If you've been to a mall you've seen See's Candy Stores. In their trademark white and black with square boxes they're pretty sterile. The attitude is one of business - know what you want, pick it up, pay for it, and get out. Not a very inspiring place for a kid. Got kids? Restrict sweets for special occasions? Then, wherever you are in the San Francisco Bay Area, pack them up in your car and drive to Lafayette. Why? 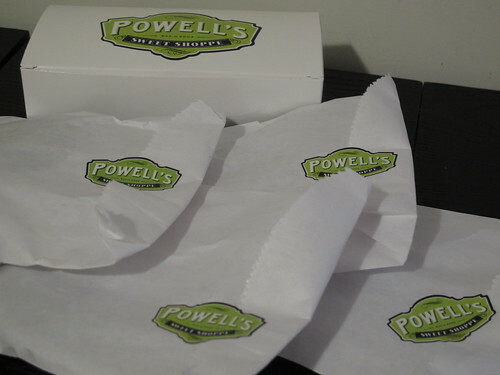 Because in Lafayette you'll find Powell's (they have other locations as well). Think this is an expensive reward? Think again. Twenty dollars went a long way. 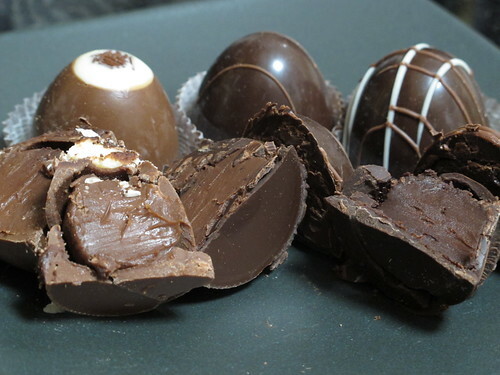 After dreaming of my visit to Powell's all day and carefully considering my purchase, I selected three truffles (bought a total of six), three sea salt caramels (again bought a total of six), and one dark chocolate covered peanut butter cup (my one impulse buy). From left to right: Cappuccino, Hazelnut, and Amaretto. cubes and I both liked the Hazelnut truffle best. Neither of us liked the Cappuccino truffle. It was light in coffee flavor, tasting more like the froth of a cappuccino. We both were thinking of an Espresso truffle and that colored our experience. The second Cappuccino truffle was the only delight that went to waste (the compost pail). 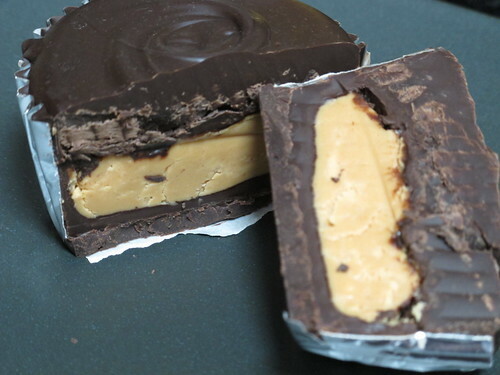 A peanut butter cup the size of a cupcake! If you're not already sold on a trip to Powell's in the near future, check out more photos on Flickr.